Croatia has been growing in popularity for years, but lately, it’s getting more and more attention for its active travel options. Along with a fascinating history and warm culture, Croatia offers some great hiking paths with stunning views of the country’s beautiful coastline. 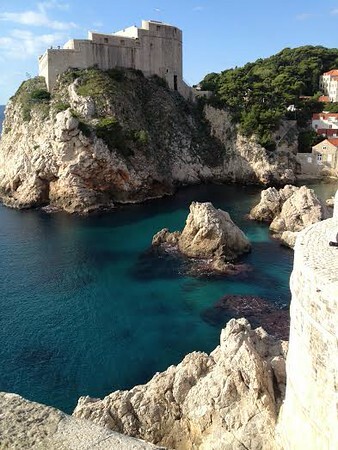 If you’re thinking about visiting Croatia, today’s guest contributor, Vanessa A Nirode, has put together a Dubrovnik and Split Hiking Guide through the towns’ famed hilly landscapes. One of my favorite countries is Croatia. I love looking out over the Adriatic Sea that forms so much of the country’s western border. 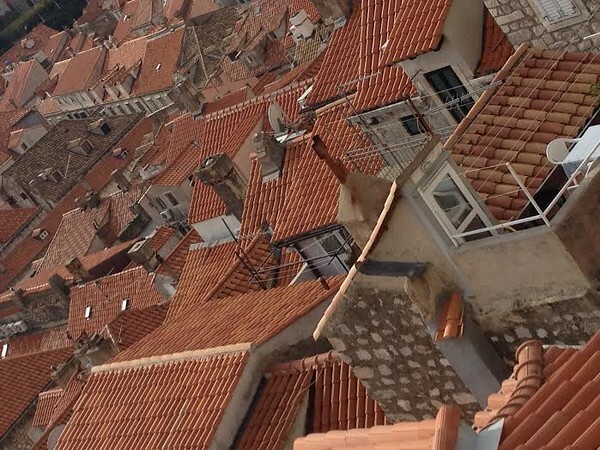 It’s easy to fall in love with the breath-taking views as you stroll along the walled old towns of Split and Dubrovnik and the winding roads that connect the two. Although a heartbreaking history seeps out from every stone, cobble, and clay roof, the people are fiercely proud of their country and its easy to see why. 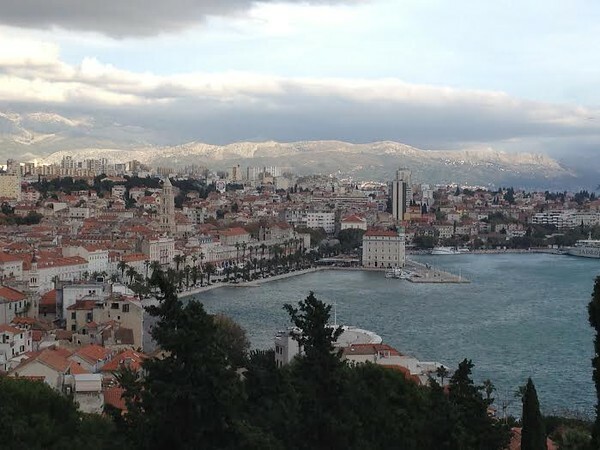 The view of Split from the top of Marjan. The old town of Split isn’t very large and you can walk through most of the stone streets in a morning. The ruins of the Diocletian’s Palace, a Unesco Heritage site built around the end of the 3rd century A.D., still exist throughout the city. Originally, the whole complex occupied around 30,000 square meters. Today the ancient fortress makes up the old town (Stari Grad) of Split. Wandering through the streets, you come upon some of the most impressive and imposing Roman ruins in the world. 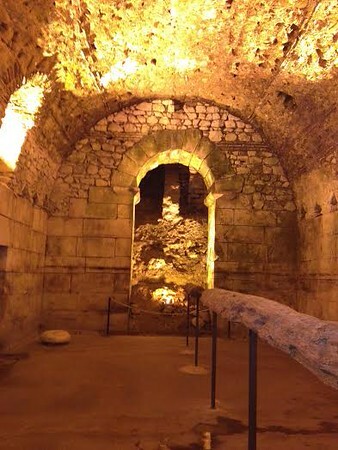 In the basement halls of Diocletian’s Palace, Split. You can also tour the Podrumi, or basement halls of the Palace. These halls were used for practical purposes and you see the rooms that handled getting water and waste to and from the palace. There is also an intact press most likely used for olives or grapes. There are open spaces with trees where the sun shines through openings in the ceiling. Not much has changed in the lower levels throughout the past centuries and it is a wonderful glimpse into life of long ago. You can easily spend three to four hours down in the basement halls. 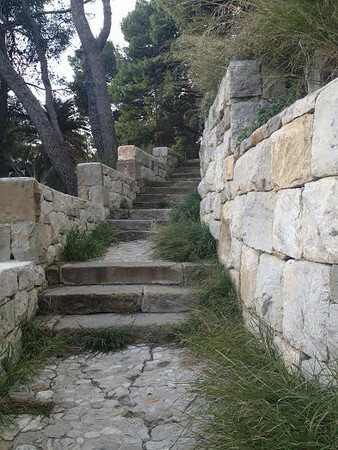 The stairs leading up to Marjan, Split. After a morning in the Palace, take a walk west along the Riva, Split’s waterfront promenade. Grab something to eat at one of the many café’s that line the street and stop for a bit and sit on one of the benches looking out to sea. Then continue along the boardwalk, keeping the sea on your left. The promenade will curve around to the left and you’ll pass the Villa Matejuska, an historical stone hotel. Follow Trumbiceva Obala as it turns again. On your right, you will see a small sign that says Marjan and some stone stairs. Climb the stairs, heading toward The Hotel Garden Apartments and keep climbing. It will seem as if you are on private property but you’re not; just keep going. You will eventually end up in a lovely green space with wide paths, trees, and the most stunning views of the city. Clay roofs from the Dubrovnik city walls. The first thing to do in Dubrovnik is to pay 70 Kuna, about 10.00 USD, and walk along the City Walls that surround the Old Town. Built throughout history to protect the city, the walls run uninterrupted for 1,940 meters and are still functional today. From the walls, you can see some of the damage to the clay roofs that still remains after the bombings in 1990s. The walls offer views of the always-beautiful Adriatic Sea and of the hilltop behind the city. You can see over the whole city as well and are able to get a good sense of where everything is. I spent hours walking the walls, exploring every nook, taking photographs and staring out to sea. View of the Adriatic from the walls of Dubrovnik. The next best thing to do in Dubrovnik is to go and visit the fort that sits on top of the hill behind the city. This fort was used to defend Dubrovnik during the bombings and wars in the 90s. Most people take the cable car up. The cable car is north of the Old Town. Take Buza Street and keep climbing toward the fire station. Once at the fire station, cross the street to your right and keep going straight. The alternative to the cable car is to hike up, which is what I did. The trailhead is a bit tricky to find. I was staying outside the Old Town and started from there. I followed Spitski Put (road) and turned right on Vladimir Nazora. Its not very picturesque along this route but just stay on the shoulder and keep walking until you get to Kamenarska, a stair street. Follow it up; take a right on Gornji Kono, then a left on N. Kullsiica. This will dead-end into a large busy road, Drzavna Cesta D-8. You should see a bus stop on the other side of the road. Carefully cross the road being very mindful of fast moving cars that will not likely slow down for you. Behind the bus stop, you will see a trail heading off into the woods. Follow this trail up the hill. It’s a good hike up with switchbacks and there won’t be many other people on it.I took my time and stopped to eat and snack and take in some views of the city spread out below. Once at the top, you’ll end up at the Imperial Fort. Just follow the walls around to the other side where you’ll find the museum entrance. The museum is a very stark, and often disturbing, memorial to the bombings and deaths of the many people who died during Croatia’s struggles of independence and territory. View of Dubrovnik from Fort Imperial. I took the cable car back down the mountain. The employees were quite amused that I had walked up and was going to ride down. They only sell tickets at the bottom so just remember to pay when you get off. I try and visit Croatia for a few weeks every year. The Croatian people are generally very welcoming, especially if you take the time to learn a few phrases of Croatian. A sincere “Hvala” (thank you) goes a long way. There are many other things to see and do in Split and Dubrovnik, as well as the other villages along the coast. 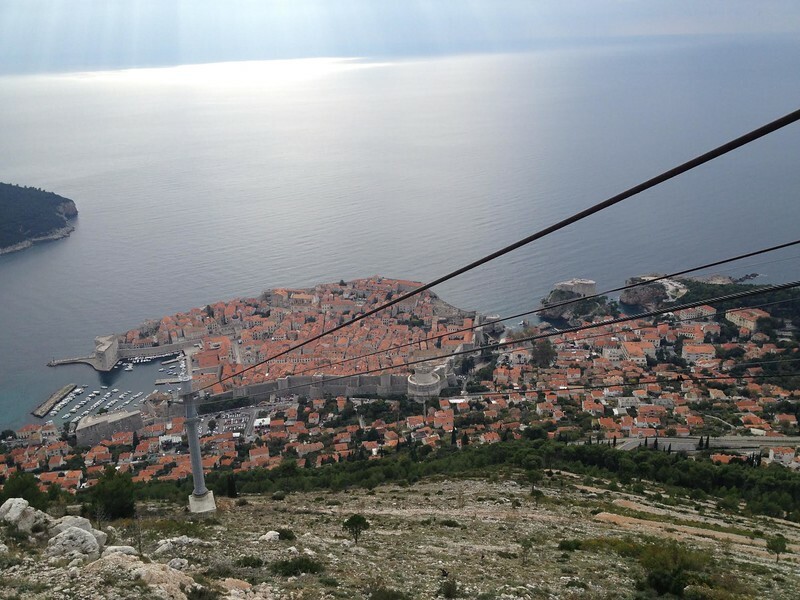 I recently spent an amazing week in Makarska, at the foot of Mount Biokovo. That, though, is a story for a future article. 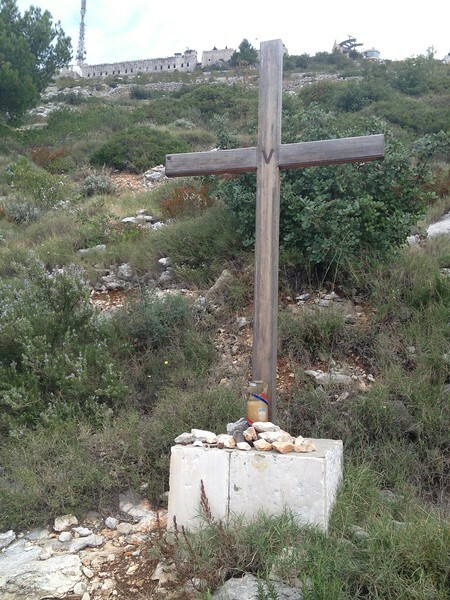 Have you ever been on a hiking trip through Croatia? Join the conversation at the My Itchy Travel Feet page on Facebook or send us an email to ask a question or share your experience. Vanessa is a solo traveler, cyclist, runner, and writer based in New York City. In her spare time she works as a tailor and pattern maker for television shows and movies. She is the grand daughter of a dairy farmer who was the son of a dairy farmer who was the son of a dairy farmer, an Amish woman, a wood worker from Ribnica, Slovenia, and a farm girl from Medvode, Slovenia. She loves all the mountains. You can read about her adventures at Girls Drink Stout and follow her on instagram.